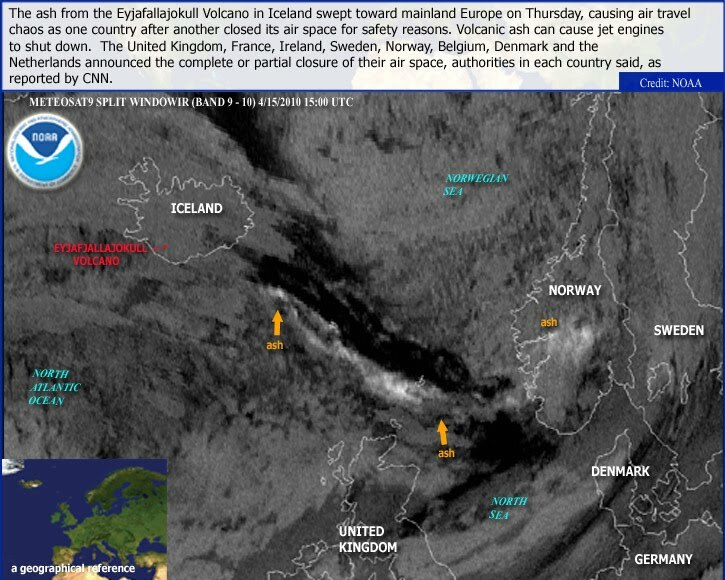 Ash clouds from the ongoing eruption of the Eyjafjallajökull volcano in Iceland continue to affect flights to and from Europe, with a number of major airports closed to all traffic. While steps taken by airlines will keep passengers away from any physical danger, it will disrupt travel today, and possibly through the weekend. Who is affected by the volcanic ash cloud? If you are scheduled to fly to or from any city in Europe in the next few days, or if your plane will make a stop in Europe, your flight may be delayed or canceled. 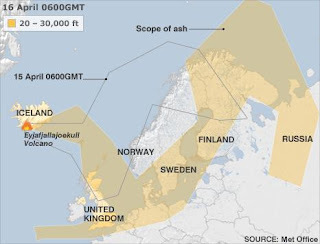 Even if you are not traveling to or through these areas, your flight may be affected if your airline has many flights in Europe since these volcanic ash delays may be difficult for the airline to schedule aircraft for their other flights. Among the non-European airlines with extensive European operations include United, American, Air Canada, Delta, and Continental. US airlines operate over 300 flights a day to and from Europe, and over half have been canceled today because of the volcano. If you are flying on any of these airlines in the next few days, even if your flight doesn't involve travel to or from Europe, you should check with your airline to see if your flight will be affected. London, Amsterdam, and Paris are also major hub airports that are used by dozens of carriers from around the world, so many smaller carriers that use these airports will be affected. What if your flight is canceled or delayed? If your flight is affected, your airline will likely try to accommodate you on another flight. Also, most airlines will waive their usual change fees and penalties and will give you the option to change your flight without penalty, or to cancel it and get a full refund. Check with your airline for details. In most cases, the airline will not provide you with meals, lodging, or other compensation for these volcanic ash delays. If you have not left for the airport, contact your airline to find out if your flight has been affected. Visit AirSafe.com for more details on your compensation rights as a passenger. Volcanic ash consists of jagged particles of rock and natural glass blasted into the air by a volcano. While most ash may fall back to the ground near the site of a volcanic eruption, the tiniest particles can remain suspended in the atmosphere for days or weeks, sometimes traveling thousand of miles each day. 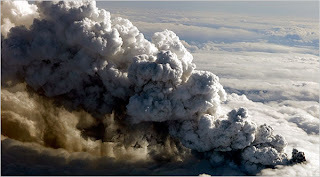 Although an ash cloud will disperse over time, even a very light volcanic ash cloud can cause significant damage to a plane that flies through that cloud. What can ash do to an airplane? Volcanic ash contains particles with melting point is below that of an engine's internal temperature. During flight, these particles will melt if they go through a jet engine. As the particles go through a jet turbine, the material can rapidly cool down, stick on the turbine vanes, and disturb the flow of high pressure combustion gases. This can cause the engine to lose some of its thrust or completely shut down. Volcanic ash is also quite abrasive, and can damage cockpit windows and can reduce or even eliminate forward visibility. There were two near disasters in the 1980s that have received the most media attention over the years. In 1982, a British Airways 747 unexpectedly encountered a volcanic ash cloud from an Indonesian volcano and the damage caused by the ash shut down all of its engines. The crew was able to restart the engines and land safely in Jakarta. In 1989, a KLM 747 lost thrust on all of its engines after encountering an ash cloud over Alaska. The crew was able to restart the engines and land in Anchorage. These were not the only significant volcanic ash encounters. According to Boeing, nearly 100 commercial jet airliners have suffered damage as a result of encountering volcanic ash in flight. Two airliners experienced damage after encountering the ash cloud from Mt. St. Helens in 1980. Over 20 aircraft were damaged by the ash from Mt. Pinatubo in the Philippines in 1991; and in 1997 and 1998, several aircraft were damaged by ash from an erupting volcano near Mexico City. As a result of the knowledge gained from these many incidents, the airline industry has developed procedures to avoid these kinds of events, primarily by reducing or eliminating flights in areas where volcanic ash encounters are likely. The steps taken by the airlines this week will likely mean that no airliner or airline passenger will have to deal with any volcanic ash emergencies. The ash cloud is covering large areas of western and central Europe, and closing or partially closing the airspace over the UK, France, Germany, Netherlands, Denmark, and several other countries. Oddly enough, flights to and from Iceland are largely unaffected. How do you pronounce the volcano's name? AirSafe.com offers a variety of of free information about airline safety and other topics. Feel free to make copies of these downloads and distribute them. You can also place links to these downloads on your web site or blog. Includes extensive information on what is allowed or prohibited on board aircraft, as well as advice on how to reduce your risk of theft or damage to items in checked baggage. Written by AirSafe.com founder Dr. Todd Curtis, this book is a practical how-to manual for providing children's guidance for using the Internet. PDF download available at http://www.airsafe.com/downloads/pati.pdf, and other ebook options at http://www.smashwords.com/books/view/12280.